Forthcoming Events in the Society calender. The Presidential Address at 2pm will be given by Ian Howard on “The Sheffield and Rotherham Railway”. The format will follow the same pattern as the previous year and the Executive Committee are delighted to say that there will once again be a subsidised lunch. Midland Railway 175th Anniversary Exhibition — 10th – 12th May 2019 at the Hallmark Midland Hotel, Derby. Thanks to the generosity of the Hallmark Midland Hotel we are staging an exhibition to celebreate the 175th anniversary of the Midland Railway. Members Meeting — Saturday, 2nd March 2019 at The Showroom (Room 5), 15 Paternoster Row, Sheffield. S1 2BX. Our speaker will be Steve Armitage, who will give an illustrated talk on “Midland Metals” from his extensive collection of Midland related photographs. The rooms will be available from 11am with the talk starting at 1.30pm. The bookstall will be in attendance. We will have a stand, E12, at the Warley Model Railway Show again this year. Members Meeting — Saturday, 27th October 2018 at The Showroom (Room 5), 15 Paternoster Row, Sheffield. S1 2BX. Our speaker will be Peter Huff, who will give an illustrated talk “The Yorkshire Dales Railway”. The rooms will be available from 11am with the talk starting at 1.30pm. The bookstall will be in attendance. Annual General Meeting — Saturday, 14th April 2018 at The Hallmark Hotel, Midland Road, Derby DE1 2SQ at 11am. The Presidential Address at 2pm will be given by Robin Cullup on “The Midland Railway in Northamptonshire and the Soke of Peterborough”. Members Meeting — Saturday, 24th March 2018 at the Hallmark Inn (formerly European Inn), Derby DE1 2SL. Our speaker will be John Downing, who will give an illustrated talk on “All change at St. Pancras.” The rooms will be available from 11am with the talk starting at 1.30pm. The bookstall will be in attendance. We will have a stand, C14, at the Warley Model Railway Show again this year. Members Meeting — Saturday, 21st October 2017 at the Hallmark Hotel, Milldale Room, Derby DE1 2SQ. Please note the venue change to the Hallmark Hotel! Our speaker will be John Stevenson, who will give an illustrated talk “The Railways of Wigston Junction”. The rooms will be available from 11am with the talk starting at 1.30pm. The bookstall will be in attendance. Members Visit — Saturday, 5th August 2017. Guided tour of West Hampstead Power Signal Box and Cricklewood Depot Box. Please contact Andrew Surry if you would like to attend: publicity@midlandrailwaysociety.org.uk, 01462 451090 (evenings only.) Please note that orange high visibility vests (not yellow) and strong walking boots (covered toes) are required for this visit. Weekend Visit to Bath — Saturday 22nd July to Sunday 23rd July 2017. Unfortunately we have had to cancel this event due to illness. We hope to be able to rearrange this meeting for 2018. Our speaker will be Geoff Bounds, who will give an illustrated talk “Electrifying the Midland Main Line - some of the challenges we have inherited from the Midland”. The rooms will be available from 11am with the talk starting at 1.30pm. The bookstall will be in attendance. In addition the St. Albans Signal Box Trust have invited us to visit the St. Albans South Signal Box in the morning. Guided tours will take place between 11 am and 1 pm. Please let the Publicity Officer, Andrew Surry, if you wish to be on one of the tours. Members Meeting — Saturday, 25th March 2017 at The Showroom, 15 Paternoster Row, Sheffield. S1 2BX. Our speaker will be Ted Hancock, who will give an illustrated talk “The Midland in the East End of Sheffield”. The talk is timed to last two hours to allow Ted to do justice to the wealth of information he has discovered. The talk will include Wicker Goods and Spittal Hill Tunnel. The rooms will be available from 11am with the talk starting at 1.30pm. The bookstall will be in attendance. Members Meeting — Saturday, 17th September 2016 at the Hallmark Inn (formerly European Inn), Derby DE1 2SL. The rooms will be available from 11am with the talk starting at 1.30pm. The bookstall will be in attendance. Non-members welcome. Our speaker will be Ian Howard, who will give an illustrated talk “The Midland Railway in Liverpool”. The talk will be in two halves with a luncheon adjournment. The rooms will be available from 11am with the first part of the talk starting at 11.30am. The bookstall will be in attendance. Our speaker will be John Miles, who will give an illustrated talk on the Midland Railway in South Wales. The rooms will be available from 11am with the talk starting at 1.30pm. The bookstall will be in attendance. 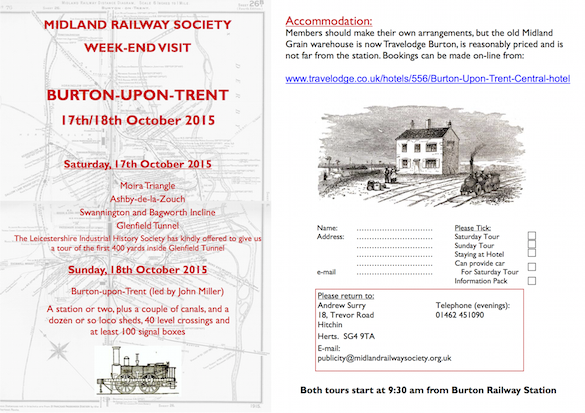 Weekend Visit to Burton-upon-Trent — Saturday 17th October to Sunday 18th October 2015. Rendez-vous each day at 09:30 at Burton Station. Contact Andrew Surry if you would like to attend: publicity@midlandrailwaysociety.org.uk, 01462 451090 (evenings only) or download form and return to Andrew if you would like to attend. Members Meeting — Saturday, 19th September 2015 at The Showroom, 15 Paternoster Row, Sheffield. S1 2BX. Our speaker will be Mike Beale, who will give an illustrated talk “The End of the Line? — the closure of the Somerset & Dorset Railway and its legacy 50 years on”. The rooms will be available from 11am with the talk starting at 1.30pm. The bookstall will be in attendance. Members Meeting — Saturday, 27th June 2015 at the Hallmark Hotel (formerly Midland Hotel), Derby DE1 2SQ. Members' Visit — Saturday, 30th May 2015. The Garden Railway of George Huxley in Church Enstone (deepest Oxfordshire). The visit will be at 3.30 pm and includes not just the railway but also the workshop and finish with refreshments in the garden. George has a number of historic models which are an important witness to the actual liveries of the Midland Railway. The number of visitors is limited to ten so please let Andrew Surry know if you would like to attend. Members Meeting — Saturday, 14th February 2015 at the Hallmark Inn (formerly European Inn), Derby DE1 2SL. Our speaker will be our Secretary, Dave Harris, who will give an illustrated talk on “An illustrated tour of the signalling in and around Burton Upon Trent”. Those of you who know Burton will know this is an extremely varied and interesting subject. The rooms will be available from 11am with the talk starting at 1.30pm. The bookstall will be in attendance. We will have a stand at the Warley Model Railway Show again this year. Bob Essery will also be at the show with the LMS Matters stand and the remaining back copies of Midland Record. Members Meeting — 11th October 2014, The Showroom, 15 Paternoster Row, Sheffield. S1 2BX. Our Speaker will be Glynn Waite who will give an illustrated talk on “Midland Railway Staff Records”. The room will be available from 11am and the talk will commence at 1.30pm. The bookstall will be in attendance. Week-end Tour — 6–7th September 2014. We will have a “Behind the Scenes” at the Keighley & Worth Valley Railway led by David Pearson and a visit to Woodlesford led by Howard Benson. Accomodation for the weekend has been aranged in the newly restored Midland Railway Hotel in Bradford. Members' Visit — Saturday, 12th July 2014. The Garden Railway of George Huxley in Church Enstone (deepest Oxfordshire). The visit will be at 2.30 pm and includes not just the railway but also the workshop and finish with refreshments in the garden. The number of visitors is limited to ten so please let Andrew Surry know if you would like to attend. Members Meeting — Saturday, 14th June 2014, Kettering Corn Market Hall. Our speaker will be John Downing giving his talk “Turn Left at Kentish Town” — an illustrated tour of the Midland goods depots to the east of the city. The bookstall will be in attendance. AGM — 5th April 2014 at the Roundhouse in Derby. Members Meeting — Saturday, 15th February 2014 at the Hallmark Inn (formerly European Inn), Derby DE1 2SL. Our speaker will be Royden Stock who will give an illustrated talk on “St. Pancras in Two World Wars”. Royden is well known for his tours of the former Midland Grand Hotel and for his erudition on the history and of the building itself. Member’s meeting — Saturday, 14th September 2013, Hallmark Inn (formerly European Inn), Midland Road, Derby. DE1 2SL. This is a reconvening of the March meeting which had to be cancelled due to the inclement weather. The speaker will be John Downing who will give an illustrated talk entitled “Turn Right at Cricklewood” and follow the goods (especially coal) traffic around London after it arrived at Brent Sidings. The room will be available from 11 am and the talk will commence at 1.30 pm. Andrew Cholerton and the bookstall will be in attendance. Note that the venue is the INN not the Hallmark (formerly Midland) Hotel across the road! Members Meeting — 26th October 2013, The Showroom, 15 Paternoster Row, Sheffield. S1 2BX. Illustrated Talk by Steve Duckworth on “Victorian Midland engines at home and at work. We know the what; what about the where?”. Room and bookstall available from 11 am. Talk to begin at 1.30 pm. Members Visit — 6th July 2013. Tour of St. Albans South Signal Box. Rendez-vous St. Albans station 11 am. Please contact Andrew Surry at publicity@midlandrailwaysociety.org.uk to confirm a place on the tour. Members Meeting — 22nd June 2013, Corn Market Hall, Kettering. Talk by Michael Woodward on Kettering - Manton - Nottingham line . Room and bookstall available from 11 am. Talk to begin at 1.30 pm. Bakewell Model Railway Exhibition — 8th & 9th June 2013. The Society will have a stand at the Wingfield Railway Group's Peak Model Railway Exhibition at the Agricultural Business Centre in Bakewell. Sheffield & District Family History Fair — 1st June, 2013. The Society will have a stand at the Sheffield & District Family History Fair which is being held at Sheffield Wednesday's Hillsborough Stadium. Tour of Unstone — Saturday 9th March 2013. Organised by Nick Wheat. Details to follow. Please note the change of venue, the meeting will now be held at the Hallmark Inn (formerly the European Inn), London Road, Derby DE1 2SL. The speaker will be Mike Beale of the Somerset & Dorest Heritage Trust who will give an illustrated talk on the 150th anniversary of the formation of the Somerset Central Railway in 1862 and the 50th anniversay of the last "The Pines" over the route in 1862. The lower hall will be available from 11 am and the talk will commence at 1.30 pm The Society bookstall will be in attendance. The meeting will be preceeded by an Extraordinary General Meeting with the single item of business: Pursuant to attaining Charitable Status, to adopt a new constitution. Held in conjunction with the UNESCO World Heritage Weekend. From 10:30am onwards. There is plenty of scope for everyone to help out and we would be delighted to see any Society member. Peter Butler gave a talk on "St. Pancras and his Station". Members' Meeting — Saturday, 3rd March 2012 at the Creative Lounge in the Workstation, Sheffield. We will be attending this event with our well stocked bookstall of Midland Railway and general railway related books. Members' Meeting — Saturday, 12th November 2011 in the Chatsworth Room at The Chesterfield Hotel, Chesterfield, Derbyshire. Ted Hancock who will give an illustrated talk on the building of the tunnels of the Dore & Chinley line. The room will be available from 11 am and the talk will commence at 1.30 pm. Andrew Cholerton will be present with the bookstall. As part of the Heritage Open Days we are running guided tours of the Study Centre allowing you to see behind the scenes and get close to the collections. The Midland Railway Society book stall will be open for business with our large range of Midland Railway related books. Entitled “Betjmen’s boyhood railway”, the tour will be led by John Downing. The tour starts at Sir John Betjemen’s statue at St. Pancras station at 11 am. Full details are in the latest newsletter. We will have our stand at the Gauge 'O' Guild show. David Pearson will give us a talk on the Midland Railway and Ireland, covering the development of its Irish aspirations, its attempt to find an Irish Sea port and the take over of the B&NCR and other developments. The meeting will be held at the Silk Mill, Derby Industrial Museum. The talk will start at 1:30pm and the room will be available to members from 10:30am. Members Meeting -- 16th October, 2010, Derby Industrial Museum. Members Meeting -- Kettering 31st July, 2010. Burton-on-Trent Tour -- 24th July, 2010. AGM & Presidential Address -- Derby 10th April, 2010. Warley Exhibition, NEC, Birmingham -- 21st & 22nd November, 2009. Members' Meeting -- 17th October, 2009. Derby Silk Mill. Ian Castledine gave a talk on locomotive builders plates of the Midland Railway. Tour of Nottingham -- 8th August, 2009. Bakewell Model Railway Exhibition -- 13th June, 2009. AGM & Presidential Address -- Derby 4th April, 2009. Members' Meeting -- 7th February, 2009. Sheffield. Warley Exhibition, NEC, Birmingham -- 22nd & 23rd November, 2008. AGM & Presidential Address -- Derby 5th April, 2008. Members' Meeting -- 23rd February, 2008. Showroom 5, The Showroom, Sheffield. Members' Meeting -- 8th September, 2007. Derby. Tour of the Brimingham West Suburban Lines -- 7th July, 2007. AGM & Presidential Address -- Derby 14th April, 2007. West Riding Tour -- 15th July, 2006. Rowsley Walk -- 3rd June, 2006. AGM - Derby April, 2006. Warley Exhibition, NEC, Birmingham -- 3rd & 4th December, 2005. Members meeting -- 19th November 2005. Derby Industrial Museum. Barnsley : Kingston School, Bradway -- 5th & 6th November, 2005. North Derbyshire Family & Local History Fair : Chesterfield -- Saturday 15th October, 2005. Appleby / Kirkby Stephen Tour -- 10th September 2005. Bakewell Model Railway Exhibition -- 11th/12th June 2005. Harpenden / Hemel Hempstead Tour -- 4th June 2005. Buxton Family History Fair -- 21st May 2005. Sheffield : Birkdale School -- 16th & 17th April 2005. AGM and Presidential Address -- 9th April 2005. Members meeting -- 19th February 2005. Derby Industrial Museum. Warley Exhibition, NEC, Birmingham -- 4th, 5th December, 2004. Behind the scenes at Wirksworth -- 22nd August, 2004. Rowthorne to Pleasley Vale Tour -- 10th July, 2004. Bakewell Exhibition -- 12th & 13th June, 2004. Halifax (Gauge O Guild) Exhibition -- 5th June, 2004. 2004 AGM and Presidential Address -- 17th April 2004. Members meeting -- 28th February 2004. Warley (NEC Birmigham) Model Railway Exhibition -- 6-7th December 2003. Members meeting -- 22nd November 2003. Barnsley Model Railway Exhibition -- 8-9th November 2003. Hazel Grove Model Railway Exhibition -- 25-26th October 2003. Members meeting -- 22nd February 2003. Autumn Members meeting -- 19th October 2002. Swansea Vale tour -- 18th May 2002. John Gough gave a talk on "Midland Railway Lines Planned But Not Constructed". Members Open Meeting - 23rd October, 1999. Newark / Mansfield Tour - 11th September 1999. Trip to the Keighley & Worth Valley Railway - 8th August 1999. Rowsley - 5th & 6th June 1999. An exhibition was being held at Rowsley village hall to commemerate 150 years since the arrival of the railway at Rowsley. This event was held by The Rowsley Association. Hereford, Hay & Brecon Tour - Saturday May 15th, 1999. Presedential Address and AGM - Saturday April 10th, 1999 in Manchester. David Tee was unable to give his presidential address due to illness. However, several members stepped in to fill the void. Roger Brettle gave a fascinating talk on Midland Railway horse drawn passenger services. Laurence Knighton recounted various tales involving royalty and the nobility at Rowsley station while Adrian Prescott brought along some old Midland plans from the Society archive. Members Day - Saturday February 20th, 1999 in Birmingham. Warley National Railway Exhibition Saturday 7th - Sunday 8th November 1998. Toton Open Day Saturday 29th - Sunday 30th August 1998. Manchester Weekend Saturday 1st - Sunday 2nd August 1998. On the Saturday the members were given a guided tour of the Midland Hotel by Barbara Frost, a Blue Badge Guide. Some members later went for a walk around the historic Castlefields area of Manchester. Sunday involved a short tour of the Bugsworth (later renamed to Buxworth) area. Members Day Saturday 11th July 1998 Wakefield. Wirksworth and Ripley Branch Tour Saturday 9th May 1998. Dr John Gough gave his Presidential Address on Records and the Midland Railway to members of the Society in the Midland Hotel, Derby. John's Presidential Address has been published by the Society and is available to members only. Burton & Ashby Light Railway Tour July 1997. West Riding Tour June 1997. Skipton & Hellifield Tour May 1997. Bristol & Bath Area Tour September 1996. Darley Dale to Monsal Dale Saturday 11th May 1996.